Blackberry Heaven | eat. cook. blog. If you follow Eat.Cook.Blog on Facebook, you know that I was in the PNW last weekend. I was in Seattle for my sister’s oldest son’s wedding and then in Gig Harbor, visiting a dear high school friend. 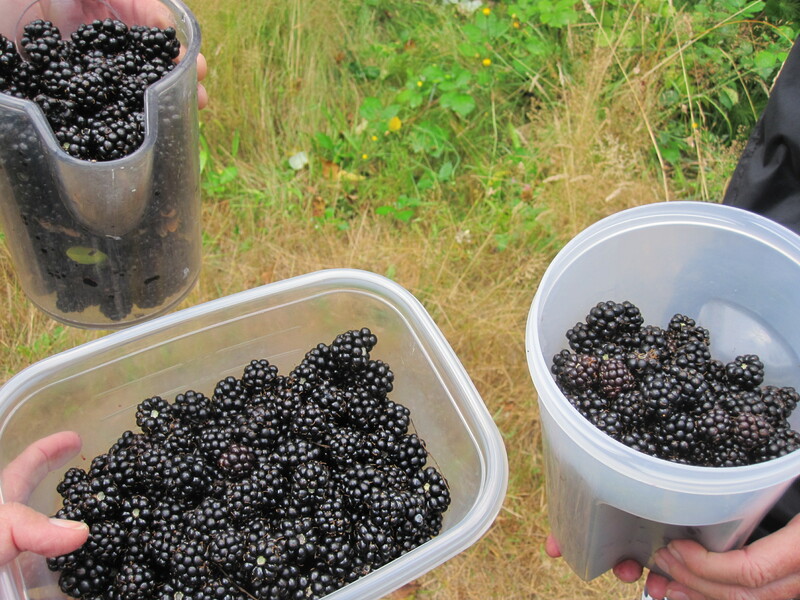 If there was a theme of the weekend it was BLACKBERRIES. 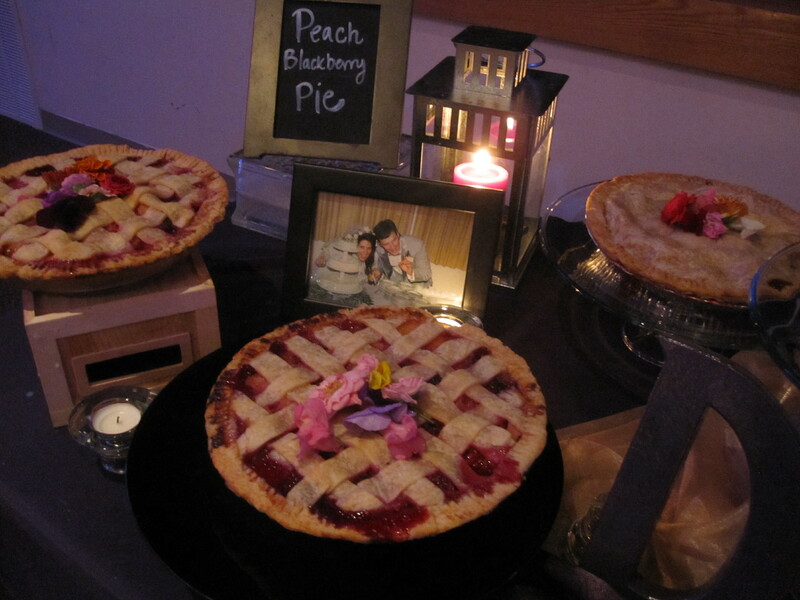 At the wedding reception, my nephew and his bride decided to serve pie (Peach Blackberry pie) rather than wedding cake…how cute is that?! I’m told that when they sampled the caterer’s pie, they weren’t crazy about it and persuaded the caterer to use my brother-in-law’s recipe. Oh, and, btw, that’s a picture of my sister and brother-in-law on their wedding day! So, after the wedding and related events, its on to Gig Harbor. Gig Harbor is an adorable little town and my friend lives a few miles from the harbor, in a little house, with a gorgeous deck overlooking a lagoon/tideland area. It’s beautiful, green and serene. 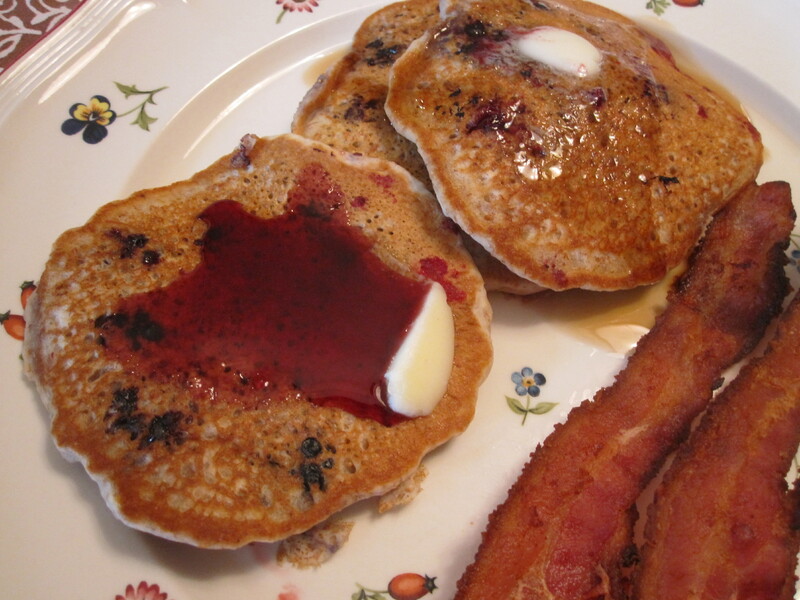 After an evening of relaxing and dinner (I made Steak with Bloody Mary Salad) and drinking wine on the deck, in the morning, she asked if I wanted blackberry pancakes for breakfast. Of course…duh. So she says, “okay, we’ll go pick some”. 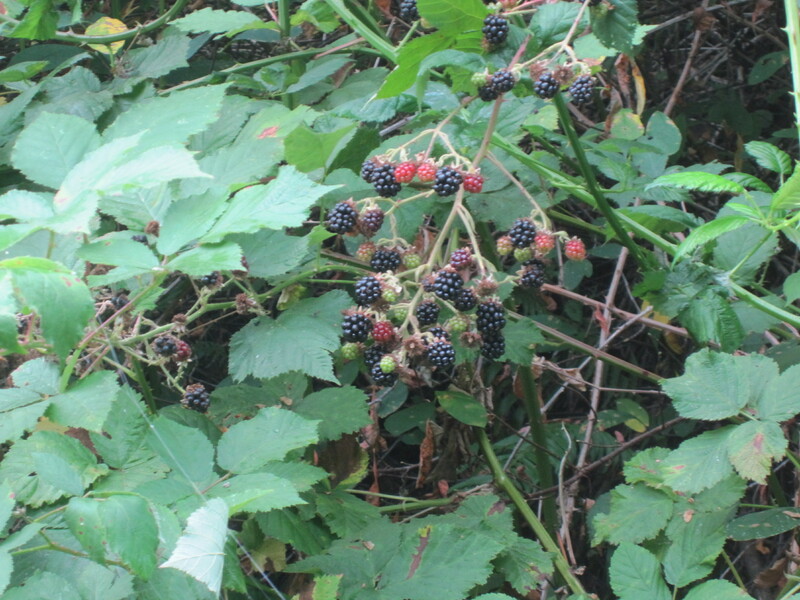 So…we walked down the lane and we picked blackberries. There were zillions of them! Blackberry heaven. And we picked a LOT of them. We took them back to the house and she made delicious pancakes. Talk about farm to table! Or, I guess, more accurately, bush to table! 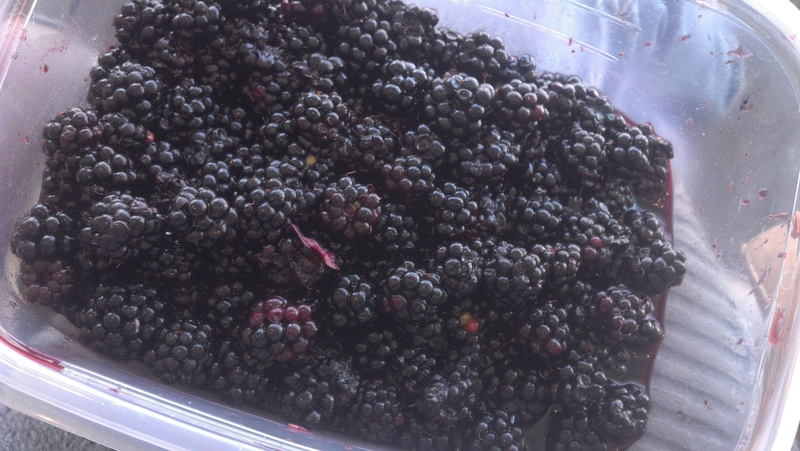 I was leaving the next day and, like a good houseguest, asked if I might be able to take some of the blackberry haul back to San Diego with me. I mean, who wants a coffee mug or t-shirt as a souvenir when you can have blackberries? I put them in a plastic container and into my carry-on bag. (Not liquid, right, TSA, right?) Okay, so by the time I got back to San Diego, a mug or shirt would have travelled a little better. The berries were a little worse for the wear, a little squishy and juicy, but that’s okay. So, now, what to make with them? Muffins? Pie? Cobbler? All sounded yummy, but it was over 90 degrees at home! Not exactly baking weather. Ice cream? Didn’t want to bother with that whole egg-custard-based thing. Sherbet? Perfect. I Googled around and found a few recipes, a couple of them made with buttermilk and I thought that sounded interesting. Pulled out the ice cream maker attachment for my Kitchenaid (best attachment ever, btw) and, voila, a couple hours of later had a creamy, tangy but sweet, beautifully dark purple bowl of frozen goodness! Oh, and if you don’t have an ice cream maker, I’ve included alternative directions for freezing below. 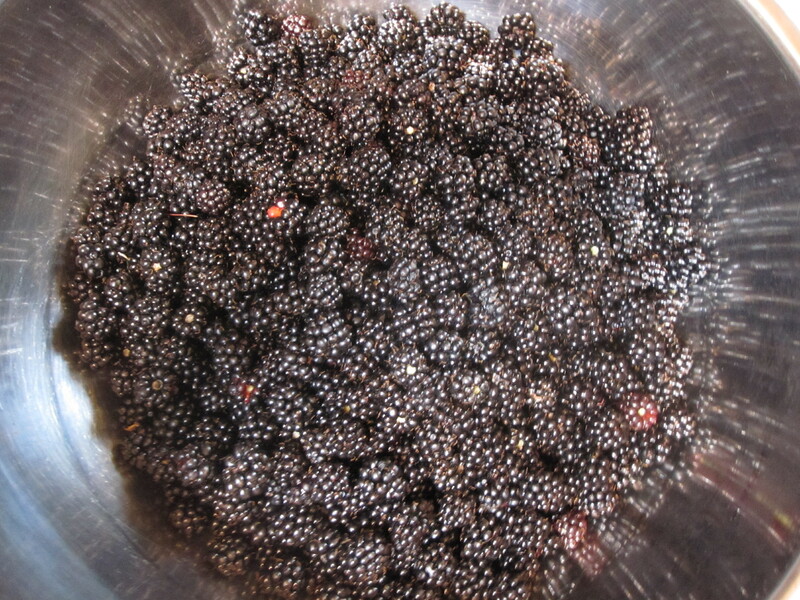 In a blender or food processor, whirl the blackberries (along with any juices from thawed frozen berries) until smooth. Pour the puree into a fine-mesh strainer set over a bowl, pressing on the solids to extract as much puree as possible; you should have about 1-1/2 cups puree. Discard the solids. Add the sugar and whisk until dissolved. Whisk in the buttermilk and vanilla. 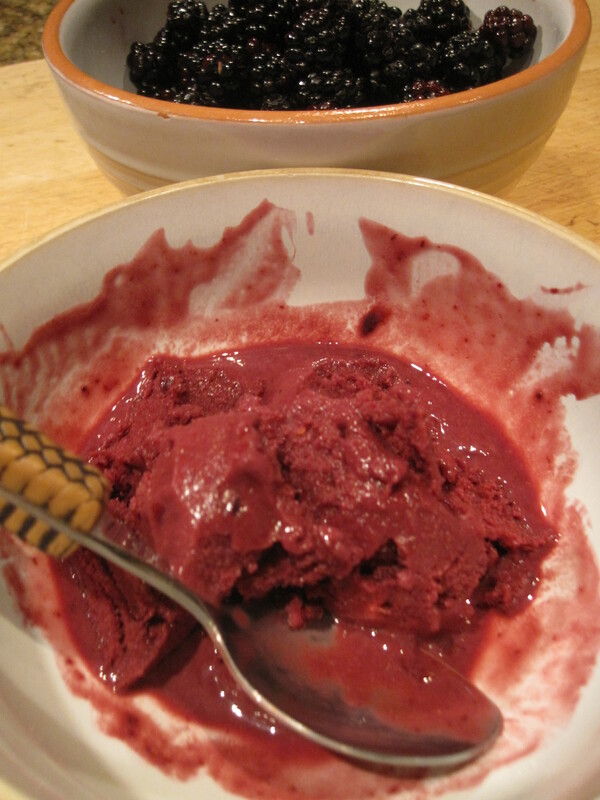 Freeze the blackberry mixture in an ice cream maker according to the manufacturer’s instructions. Transfer to an airtight container and freeze until firm enough to scoop, about 4 hours.